Endorsed by a deluge of tech benefactors, exoskeleton industry stands to gain rewarding proceeds from a plethora of respectable fraternities, including the likes of the military, medical care, industrial domains. More than a decade back, the notion of paraplegics being able to regain control of their limbs or heavy equipment transfer across an unfriendly terrain had been deemed ‘impossible’ by experts. Now, close to the termination of two decades since the onset of the 21st century, the utopia that was conceived back then may finally have a little semblance to reality, as exoskeleton industry has conveniently established itself as one of the most remunerative business spheres. This is quite apparently vivid from the estimates – as per Global Market Insights, Inc., exoskeleton market size was pegged at USD 110 million in 2016, plausibly driven by the rampant demand for standard and customized exosuits for paraplegic patients, military personnel, elderly patients with zero mobility, and subjects adversely affected by strokes or other neurological disorders that impact mobility. In recent times, exoskeleton industry has been characterized by an abundance of contemporary innovations, on account of two major rationales – to begin with, the number of people suffering from immobility has been on a rapid incline lately. As per a reliable survey, every year, close to 424,000 people die from falls, while over 37 million falls demand round-the-clock medical attention. Mobility issues rank second among the most dreaded disabilities in the U.S. alone. To combat the rising problems arising due to the inability to move, companies have been developing exoskeletons – technologically advanced devices that give the elderly the independence to move around and allow the injured and the disabled to walk again. Secondly, the mobility problems arising in the aging and disabled populace vary from person to person, which leads to consumers demanding personalized devices. This has undeniably led to the generation of a lucrative growth avenue for exoskeleton industry players, pertaining to which they have been striving to bring forth an exclusive product portfolio for consumers. An exoskeleton market research report compiled by Global Market Insights, Inc., claims this business space to liberally exceed the USD 3 billion frontier by 2024, which is a marked development from its base valuation in 2016. It is prudent to mention that exoskeleton market, despite encompassing a profitable application spectrum, has been forecast to accumulate copious monetary returns from the medical care domain. The substantially escalating product demand from private and public health care centers for rehabilitation therapies post paralysis, spinal cord injuries, strokes, and traumatic brain surgeries would be the most pivotal factor contributing to the growth of exoskeleton industry share from healthcare applications. The deployment of exoskeletons for paraplegic patients, gait training, and extensive physical therapy is certain to impel exoskeleton industry size from the medical care sector, forecast to account for more than 50% of the overall revenue share by 2024. Enumerated below are some of the most exemplary device innovations underlining the high-grade developments in exoskeleton industry that would unrefutably contribute to its growth in the many years to come. Ekso Bionics Holdings, Inc., one of the most predominant behemoths exploiting exoskeleton market, has recently collaborated with Genesis Rehab Services (GRS), a global leader renowned for providing occupational, speech, & respiratory therapy to the elderly, with an aim to analyze how efficiently the EksoGTTM can be used for rehabilitation therapies. For the record, EksoGTTM is the first wearable exoskeleton that has been approved by the FDA to be used in the therapy procedures for patients affected by strokes and SCIs (spinal cord injuries), and has already garnered acclamation in exoskeleton industry, which is evident from its robust deployment across major health care and rehabilitation centers. Now, having joined forces with Genesis Rehab Services, the exoskeleton market giant plans to upscale its knowledge regarding post-acute rehabilitation settings so that it would be able to improve patient outcomes in hospitals and medical care centers. Another powerful giant that has successfully established its foothold in exoskeleton industry, Panasonic, has introduced a range of innovative devices that would help to lift and carry heavy loads without major hassles. The device, called the AWN-03, is an assist exosuit exclusively designed for lower back support. The device apparently dispatches motor signals demanding a prompt action when it senses the wearer’s motion while lifting or carrying heavy objects. It pushes on the wearer’s thighs and simultaneously raises the wearer’s upper body, thereby reducing the stress on the lower back by 15 kg. The vivid comprehensibility of the device is likely to augment its sales and popularity in exoskeleton market. In addition to AWN-03, Panasonic has also introduced the PLN-01 to control the wearer’s motion while walking or running, and the Power Loader to encourage the elderly manage routine tasks without help. An association of highly skilled biomedical engineers at the École Polytechnique Fédérale de Lausanne may have just come up with something that is likely to revolutionize exoskeleton industry. The researchers have recently developed the Active Pelvis Orthosis (APO) – a smart robotic exoskeleton that has been designed to automatically protect its wearer from hitting the deck. The device, if and when commercialized, will help prevent falls in amputees, patients with Parkinson’s, and the elderly, which would, in all likelihood, lead exoskeleton industry to accumulate substantial returns. The determinant that testifies the uniqueness of this device is that it can accurately detect a person’s fall in merely 350 milliseconds, – courtesy, the numerous algorithms it has been embedded with. The fact that it does not require the wearer to be conscious or trained to use the device will escalate its popularity, further augmenting the profitability landscape of exoskeleton industry. 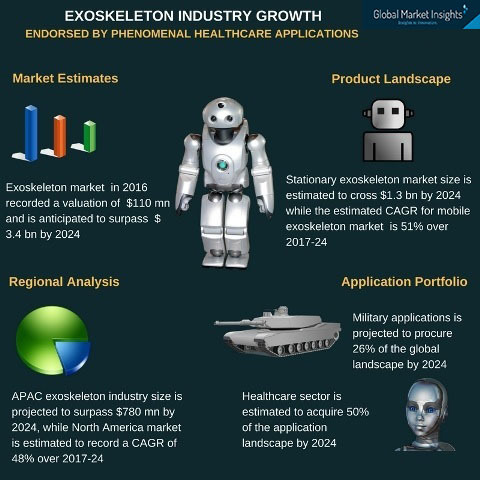 The application spectrum of exoskeleton market is not merely replete with the healthcare domain, though the segment is one of the most lucrative avenues of this vertical. Besides medical care, exoskeleton industry stands to gain much from the industrial and military sectors as well. Numerous companies have been investing heavily in research and development endeavors to exploit the potential of this wearable device in the military sector. Lockheed Martin, one of most exemplary players partaking in exoskeleton industry share, has recently announced its plan to secure legal approval for using its licensed bionic augmentation technology to support its FORTIS industrial exoskeleton project. Through this program, the exoskeleton industry player aims to significantly reduce the workload for military personnel, by transferring excess pressure through the exoskeleton to the ground in a lightweight process that apparently renders heavy tools weightless, as assured by Lockheed Martin. In a bid to combat the increasing demand for these wearables across the healthcare, military, and industrial fraternities, companies have been going the whole hog to bring about technological advancements in product design, development, and deployment, which would have a commendable impact on the product landscape and the commercialization scope of exoskeleton industry. This business sphere is also strictly regulatory-driven, given that medical devices of such a sensitive nature have to mandatorily tested and verified prior to being granted the approval for commercialization. Ergo, it can be unquestionably stated that the appreciable efforts undertaken by exoskeleton market giants are certain to bear fruit in the forthcoming years. Validating this declaration is the fact that exoskeleton industry size, as per analyst forecasts, is certain to surpass a shipment volume of close to 86,000 units by 2024.